Let me begin with a shout out to all of our neighbors in the Northeast who are reeling from Hurricane Sandy and its immense impact. Our thoughts and prayers are with you. 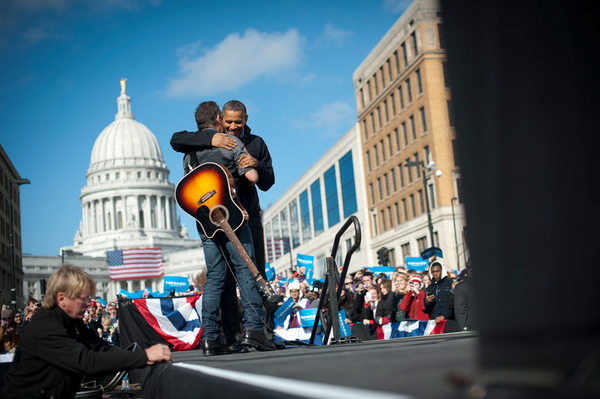 So, it's good to be here with you today--and it will be great to feel the power of your votes and voices tomorrow. I'm a husband and a dad, my lovely wife Patti is here with me. We've got three kids growing up and on their way out into the world, I'm 63 (Patti is much younger)... but we have both lived through some galvanizing moments in American history: the Civil Rights struggle, the Peace Movement, the Woman's Movement, we played in East Berlin one year before the Fall of the Berlin Wall, and we were with Amnesty International a year before the release of Nelson Mandela and the end of apartheid. These were days when you could feel the winds of change moving and the world shifting beneath your feet. And... we both remember another galvanizing moment, the night that President Obama was elected. It was an unbelievable evening, when the hope of your heart felt fulfilled, when you could feel the locked doors of the past being blown open to new and previously unimaginable possibilities-- to fresh Hope and Change. Today we have another battle. Now we are charged with the hard daily struggle to make those possibilities, those changes real and enduring in a world that challenges your hopefulness, a world that is often brutally resistant to change. We've lived through that struggle over these past four years when the forces of opposition have been tireless. I'm thankful for the historic advances in healthcare. I'm thankful for a more regulated Wall Street that will begin to protect our citizens from the blind greed of those who over reach. My father worked on a Ford assembly line when I was a child and I'm thankful that we have a President that had faith in the American automobile industry and that General Motors is today making cars. What else would I write about. I'm thankful that we have a decisive President working hard to keep America safe... and I'm appreciative of the fact that, as promised, he has ended the war in Iraq and is bringing the war in Afghanistan to a close. I'm here today because I'm concerned about Women's Rights and health issues both at home and around the World. I don't have to tell you about the dangers to Roe versus Wade under our opponents policies. I'm also troubled by thirty years of an increasing disparity in wealth between our best off citizens and everyday Americans. That is a disparity that threatens to divide us into two distinct and separate nations. We have to be better than that. Finally I'm here today because I've lived long enough to know that the future is rarely a tide rushing in. Its often a slow march, inch by inch, day after long day. We are in the midst of one of those long days right now. I believe that President Obama feels those long days in his bones for all 100 per cent of us. He will live those days with us. President Obama ran last time as a man of hope and change. You hear a lot of talk about how things are different now. Things aren't any different--they're just realer. Its crunch time. The President's job, our job--yours and mine-- whether your Republican, Democrat, Independent, rich, poor, black, brown, white, gay, straight, soldier, civilian--is to keep that hope alive, to combat cynicism and apathy, and to believe in our power, to change our lives and the world we live in. So, lets go to work tomorrow, and the day after, and the day after that.. Lets re-elect President Barack Obama to carry our standard forward towards the America that awaits us.